Successfully Added Security Camera w/ Telescopic IR Illuminator to your Shopping Cart. 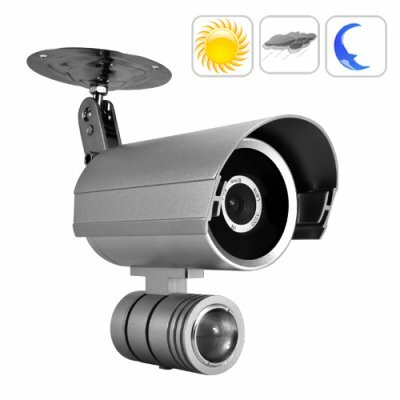 New Waterproof CCTV Security Camera with Telescopic IR Illuminator. Are you concerned about the security of your business or home, especially at night? Then welcome to the best Night Vision Security Camera on the market today! With the latest features in surveillance technology, including Sony CCD and Samsung IR, the I62 security camera will put your mind at ease! This Security Camera comes with a uniquely designed telescopic IR Illuminator, which contains newly designed Samsung IR LED's placed inside a telescopic tube with a focusing lens so that you get better clarity and distance from your night vision than you ever have before ! How does the IR Illuminator work? It generates an IR distribution that is concentrated through an especially designed and polished Corning lens so the night vision IR light focused exactly on the area being aimed at by the security camera. The result is a much clearer and brighter image than the standard circular array of IR's. Built for any environment, this Security Camera outclasses many similar surveillance cameras by having sharper, brighter and crisper images every time, indoor and outdoor, day or night. Having a Sony HAD CCD sensor with 480 TVL resolution, you will always have clear video footage. Combine that with the heavy-duty cast aluminum body and sliding hood for all weather protection, and the uses for this one Security Camera become almost endless. Use one to watch the backdoor, another to watch the driveway, another to watch the entry, and another to watch the office, whatever your need then the I62 is the one Security Camera answer! Combining virtually indestructible intelligent design, easy mounting and installation, Sony CCD, and new IR Illuminator, the I62 Security Camera is the must have Security Camera for people we need the latest in surveillance technology. Available in our warehouse right now, order yours today and we will express ship it out to you tomorrow - guaranteed! This video surveillance product should be setup and installed by an experienced user/professional for optimal performance. Chinavasion, as a wholesale supplier, does not provide installation services. Is this CCTV Security Camera like ones I have seen from Samsung/Panasonic/Vitek/IQ/Messoa ? No, it does not. The I62 is better designed, more unique, but only at 1/3 of the price of a Samsung/Panasonic/Vitek/IQ/Messoa.